Prices will vary depending upon exchange rates, fuel surcharges and departure taxes but following are ballpark figures for the various trip segments. Flights arriving and departing through the fashion-capitol of the world, Milan! Breakfast and dinner included. Mountaintop dinner with wine via snowcat atop Mountain Rigugio. Wine and cheese welcome reception. 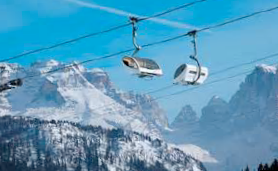 Madonna di Campiglio, a discreet and elegant town nestling at an altitude of 1550 metres in the stupendous valley between the Brenta Dolomites and the glaciers of Adamello and Presanella, is today most certainly Italy’s number one ski resort as well as one of the most important resorts in the Alps. How unbelievable is this one? Flight from Milan to Dublin via Aer Lingus. Bus to Limerick with a stop at the National Gardens. Four nights lodging in Limerick at the 4-Star George Boutique Hotel in city center. Breakfast buffet daily. Guided tour of Limerick and entrance to St. John’s Castle. Full day tour of Kilarney and Ring of Kerry. Medieval banquet at Bunratty Castle and then St. Patrick’s Day in Limerick! 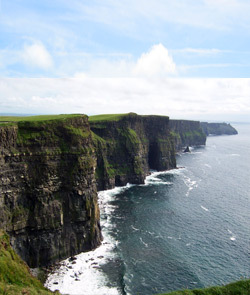 Full day tour of Cliffs of Moher. Visits of Kilkenny and the Rock of Cashel on the way back to Dublin. Three nights in Dublin at the Gibson Hotel. Breakfast buffet daily. Half day tour of Dublin, including St. Patrick’s Cathedral and Trinity College. Full day tour to Boyne Valley with visits to Bru na Boinne Visitors Center and Trim Castle. Flight to USA or Edinburgh. Full day tour of Edinburgh with visit to Edinburgh Castle and Royal Yacht Brittania. Lodging at 3-star Novotel in city center, breakfast included.